Today is one of those rare days I am actually ashamed of being a Singaporean. Most people from my country are considerate folks, who, largely because of having to live in a densely populated city, were pretty mindful of making too much noise, especially late into the night. Unfortunately the Singaporean owners of the new 2040 container market thought otherwise. 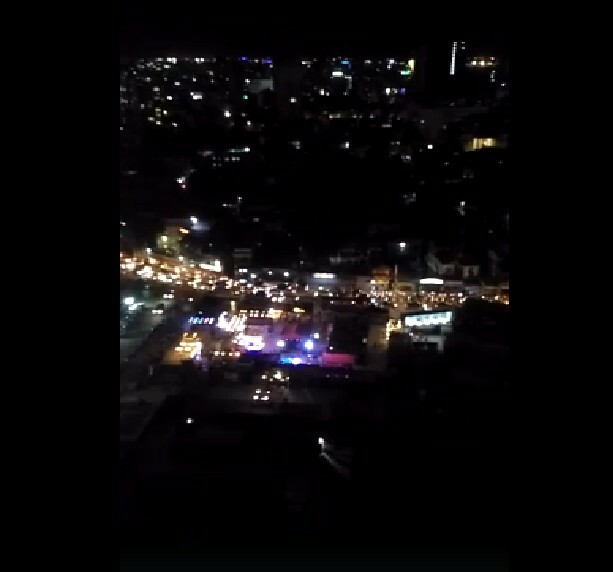 As you can see from this video taken from my apartment window, the noise generated from the open stage at the middle of the market shows an utter lack of consideration for the people around. And it had been going on for the last three nights, well into the wee hours of the morning. (Previously, the land on which the market stood was a waterpark, and even though there was music playing every night, the music was kept at a relatively considerate level, so there was no issue). I spoke this evening to the one of the owner – well screamed to is more appropriate because the music was so loud I could barely hear myself nor him – I told him that look, it’s fine if they wanna play a little music to spice up the atmosphere, but if it’s reached the point where I can hear the bass through the walls of my room that is furthest away from the location even with the windows closed, then it’s too much. He insisted that it was only a soundcheck, and the actual volume would be way softer (untrue, see video in the comments section). I told him you don’t need three days to get the sound right, which he then blamed on the Cambodian culture – saying that since I had lived here long, I should know how slow the Cambodians are in getting things right. At one point he insisted that the license he has gave him the right to play music as loud as he want and he actually expected the residents around the area to put up with the noise until some special speakers arrive that could channel the sound into different areas of the venue without the central outdoor stage having to play so loud. I asked him why can’t he just get the soundguy to keep the volume to a humane level in the meantime? It was a totally reasonable request which in no way would affect his business at all. Especially being an entertainer in the F&B business here, I pretty much observed how it is the places that have music at a reasonable level that attracts and keeps the patrons. He said if the music were softer, it would affect his business because the people at the far end of the market would not be able to hear, and the residents should be considerate enough to not let his business be affected. (Which is kinda funny because given how little the crowded had turned out in the last three days, I believed the deafening music actually drove people away). He also pretty much threatened that it will be like this EVERY NIGHT for as long as the container market was running. Not surprisingly, I had been blocked from 2040 container market’s FB page and my comment about the inconsiderate behavior deleted. So, yeah, to all those other people who had been – and will continue to be – affected by the act of this incosiderate person, I offer my sincerest apology. Also my apologies to the Cambodian people, you shouldn’t be blamed for the irresponsible action of my countryman. As a Singaporean living in Cambodia, I would love to have my fellow Singaporeans do well in this country but at the same time respect the people, be they locals or expats living here. If we could all be good neighbors, everyone wins. So it truly distresses me that this Singaporean thought otherwise. This is not who we Singaporeans are as a people. (I have nothing against the vendors who operate in the market. I would love to see them succeed, but I think they should really speak to the management about this issue because a bad rep for the venue is going to hurt them, as is the deafening volume of the music being played. Update: So we learnt from the apartment management that they had indeed as expected, received multiple complaints from residents since this morning, and they have contacted the 2040 owners about the issue. The owners have agreed to come by the apartment to see for themselves exactly how noisy the music they were blasting are, and will adjust accordingly. Secondly, don’t go Ah Beng on me when I tell you there are very infuential people living in the apartment, and say things like, “oh you know In Cambodia threats don’t work.” Because I wasn’t threatening you. Thirdly, don’t say, “ok, since you know these people (I never said I did), since you got so much backing, get your people to come talk to me.” I had been here long enough – very sure much longer than you -to know that at the end we are guests in another country. When you act like you are the boss of the basketball court here, it’s gonna come back and bite you. Fourthly, learn some PR. Because what’s the point of being so arrogant and defiant when in the end, you have to swallow your pride and work with the apartment management to make sure that you don’t invite trouble like that in future? Previous ArticleLOCAL ARTIST TASKED TO MAKE BIRTHDAY GIFT FOR JOHN LEGEND’S WIFE! Next Article KIND GRAB DRIVER GAVE $20 TO NETIZEN TO CELEBRATE WITH HER “KIDS” IN THE SHELTER!